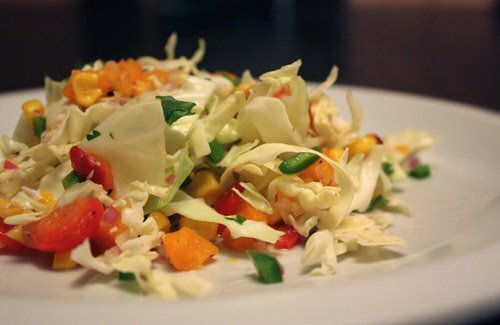 This is the slaw that inspired the light tex-mex meal. I knew it was in Nuevo Tex-Mex which got me flipping through the book again and meal planning. I often say of some cookbooks that I want to make everything in them, and I mean it when I say that. It may take some time given how many books are in that group, but this book is one of them. And, now for a confession. I always post about dishes that I’ve just made for the first time, or new variations on dishes, or seasonal versions of recipes that I want to remember. However, I have made this slaw before. But, I didn’t make it right the first time. It was years ago, I was rushed, and I glanced at the ingredients and didn’t read all of the instructions. This time, I read more carefully and prepared it as it was intended. That first time, I made a mostly raw slaw with bell peppers, jalapeños, cabbage, onion, and cooked corn. I missed the roasting step which, it turns out, makes a completely different and entirely better slaw. Because it’s January and fresh sweet corn is not available, I used frozen corn kernels which were ok. If making this with fresh corn, you should roast it on the cob and then cut off the kernels. With frozen corn, I defrosted it, tossed it with a small bit of oil, spread it on a baking sheet, and roasted it in the oven until fragrant and slightly browned. Its flavor became concentrated, it became even sweeter, and it was fantastic. The bell peppers should also be roasted, then skinned, seeded, and chopped. I seem to remember Bobby Flay mentioning on thousands of occasions that peppers should always be roasted in the oven instead of over a gas flame. Oven roasting actually cooks the pepper flesh instead of just charring the skin and results in better flavor, and that’s what I did here. He’s right about oven roasting, but I also do the quick and easy turning over a gas flame when short on time. So many confessions today. 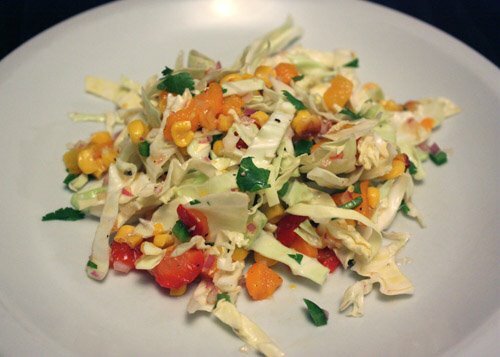 The slaw, then, was crunchy raw cabbage, jalapeño, and onion, sweet and concentrated roasted corn, oven roasted red and orange bell pepper, and lemon juice, champagne vinegar, and chopped cilantro. The combined ingredients sat in the refrigerator for a couple of hours, and came out bursting with varied flavors, colors, and textures. You can control the heat of the jalapeños by removing the seeds and membranes which I did because the sauce served with this meal was already hitting the upper level of our heat tolerance. That left the slaw as a welcome, cool, acidic, sweet, savory, fresh part of the light tex-mex meal. oh yum. Love the toasted corn! Great combination. Love the jalapeno in this salsa. I would definitely make this, sans the onions - I love jalapeno in anything! I bet with fresh roasted corn it would be to die for! Sounds nice and light. I like that you didn't put mayo in it. slaw is always a terrific side dish, and i love that you put a little heat into this one. it's perfect for your tex-mex meal! I'm really happy to see this post. We make Mexican food quite a lot, and it's often difficult to find side dishes that are not heavy (to go with the often heavy main dish). Thanks- bookmarked! This looks fabulous! I love that you can keep it light, but keep the Tex Mex flavors. I'll take some crab cakes with a side of this slaw! (please).